Purity, optimum quality, unadulterated nature, high nutritional value and longer shelf life are some of the salient attributes that make our Frozen Pork Tails highly popular. 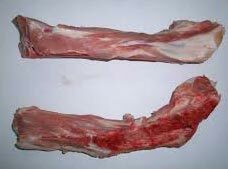 We share glorious credentials in the list of top Exporters and Suppliers of Frozen Pork Tails from Thailand. Our cold storage space is suitable for retaining the quality and purity of Frozen Pork Tails. In addition to this, due to our vast distributed network, it has been an easy job for us to reach buyers within the stipulated time frame.